FRAISER: Well, your brain chemistry's been seriously compromised. All of you have abnormally low levels of serotonin. FRAISER: It's a neurotransmitter that effects moods. Now, low levels would account for depression, but not these other effects. Come here. I want you to take a look at this. ~ Stargate SG-1, "Fire and Water"
Last week Ben Goldacre wrote in his Bad Science blog (and his column for The Guardian) about the Brain Gym, a UK school program that some teachers love despite the pseudoscientific explanations for its various exercises. He points to one possible explanation: a report in the March 2008 Journal of Cognitive Neuroscience that shows that people are more likely to believe explanations that include neuroscience technical terms. So, if you are writing a story and need to create a plausible explanation for your characters' behavior, try a little neuroscience! Read a preprint of the original article: Weisberg DS et al. "The seductive allure of neuroscience explanations", J. Cogn. Neurosci., 20: 470-477 (2008) (pdf). If you have access to the online version of the Journal of Cognitive Neuroscience, you can read the article here. 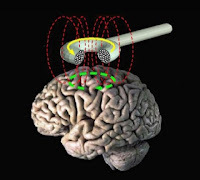 Image: Depiction of eddy current brain stimulation, from the work of Eric Wasserman an the Brain Stimulation Unit at NINDS.